Five players including Devlin Hodges from Samford, Hayden Hildebrand from Central Arkasas, Ronald Smith II from Columbia, Justin Strong from Montana, and Elijah Marks from Northern Arizona have been selected as the College Sports Journal All-Stars for the week ending Oct. 1st, 2017 from the NCAA Division I FCS schools. The honorees are listed here with their achievements and their school, position, class, and hometown. Devlin Hodges, Samford, QB, R-Jr., Kimberly, Ala.
Samford quarterback Devlin Hodges went 21-for-26 for 323 yards and three touchdowns through the air as the Bulldogs knocked off 11th-ranked The Citadel on Saturday, 35-14. The reigning SoCon Offensive Player of the Year, Hodges also ran for a score to help Samford break a two-game skid and jump three spots to No. 20 nationally. The redshirt junior from Kimberly, Alabama, completed three passes of at least 50 yards in the game, including a 70-yard touchdown to Yassar El-Amin and a 63-yard scoring strike to TaDarryl Marshall. With his 16th career 300-yard passing game, Hodges moved up five spots to fourth in league history with 7,942 career passing yards. Hayden Hildebrand, Central Arkansas, QB, Sr. – Quarterback – Bossier City, La. HIldebrand outdueled the Walter Payton Award winner Jeremiah Briscoe, throwing for 294 yards and four touchdowns in UCA’s 41-30 upset of No. 3 Sam Houston State. He sealed the win with a 17-yard TD pass to Brandon Cox with 8:34 left after the Bearkats had cut the lead to 34-30. The senior had touchdown passes of 46, 25, 74 and 17 yards, leading an offense which averaged 7.2 yards per play. Ronald Smith II, Columbia, WR, So. St. Louis, Mo. Smith had himself a game against Princeton, leading the Lions to their first win over the Tigers since 2010 and their first 3-0 start since 1996. Smith finished with 236 receiving yards on 10 receptions and two touchdowns, including a 63-yard touchdown catch and run with 1:12 remaining that proved to be the game winner. Smith’s 236 receiving yards is fourth-most in the FCS this season as well as a Lions single-game record and the 11th-best mark all-time in Ivy League history. Justin Strong, Montana, S, R-Sr., Rialto, Calif.
Strong almost single-handedly led the Montana defense to a 45-33 Big Sky win against Portland State. Literally. With one arm in a cast that was heavily taped, Strong recorded a trio of interceptions for a total of 116 yards. One of his picks he ran back for a 64-yard score with three minutes remaining in the game. Strong also halted a two-point conversion attempt by Portland State, snatching the ball out of the end zone to stop the Vikings. 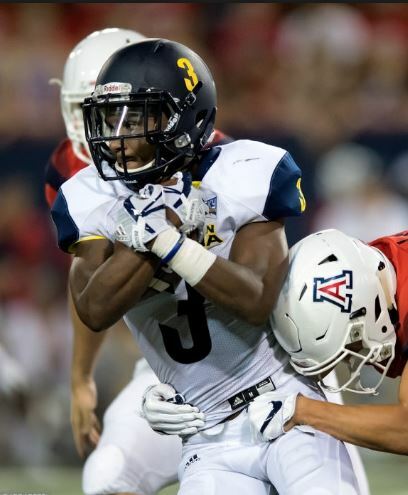 Elijiah Marks, Northern Arizona, WR/RS, Sr., Goodyear, Ariz. Wide receiver Elijah Marks showed that his speed could carry him the length of the field, as the senior returned a kickoff 100 yards for the touchdown – a career high. The score made it a two-possession game as the Lumberjacks never trailed. Marks’ return marked the first time since 2013 a Lumberjack returned a kickoff for a score, and it also tied the longest scoring play in school history. Marks finished with a total of 123 yards on a pair of kickoff returns and also ran back one punt for 10 yards in the Lumberjacks 48-20 victory over Northern Colorado.